The crowd on deck stood in hushed, awed wonder as the first sails began to descend like ghostly, off-white theatre curtains. One after another, 42 of them unfurled from the skeletal steel crossbeams that framed the five towering masts of the Royal Clipper to fill the midnight Bajan sky. The warm breeze hit them with an audible slap, and the great ship began to strain like a thoroughbred in the starting stalls. As she began to get under way, passengers on the nearby P&O Ventura came out onto their cabin balconies to watch us go. In the silence, you could almost hear the sound of jaws dropping to the deck. Then, as the haunting theme of Vangelis’ 1492: Conquest Of Paradise began to float out across the ink black waters of Bridgetown harbour, the cameras began to flash along the length of the big cruise ship. As I discovered during the course of the next week, wowing the crowds was something Royal Clipper does with breathtaking ease. The largest sailing ship built for almost a century, this 5,000-ton vessel carries 228 passengers on week-long winter forays around the highlights of the eastern Caribbean on two alternating itineraries out of Bridgetown. With her raked bowsprit and her quintet of towering, ochre-coloured masts, the ship is unmistakable. Passengers whose must-have list for a Caribbean cruise includes diversions such as rock climbing walls, an array of theatre entertainment and enormous, round-the-clock food options, should look away now. 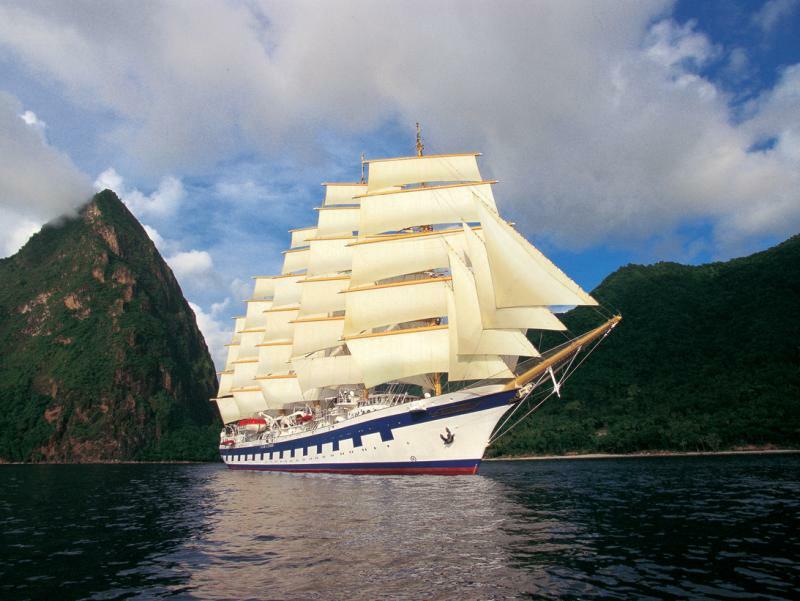 Royal Clipper is not for them. This vast, gloriously anachronistic enigma of a vessel is a siren call to a totally different traveller; the ‘less is more’ type that instinctively understands, and heeds, the ageless romance of a tall, towering sailing ship, heeling into the wind under a full spread of canvas just like generations of her forebears. And heel she does, quite magnificently. Long, low, narrow and unencumbered by stabilisers, the Royal Clipper will roll, rock, and even pitch gently from time to time. For the first day, I was a bit disconcerted to hear the sporadic splash of the ocean as it thumped against the twin portholes in my cabin, giving it the appearance of an over-energetic twin tub washing machine. Such quirks are just part of what add up to a quixotic, addictive whole that became utterly compelling over the week. With her gorgeous sheer and blue accented hull, the five skyscraping masts and acres of lethargic, billowing canvas, the Royal Clipper has a sublime, bewitching stance when seen from any angle. She is nothing less than a sea-going cathedral, embellished with a swathe of taut, gently shuddering block and tackle, gleaming brass, and burnished teak underfoot. This is no mere adventure around a string of compelling Caribbean hot spots; this is time travel: two voyages in one. None of this should imply a lack of creature comforts or modern amenities. 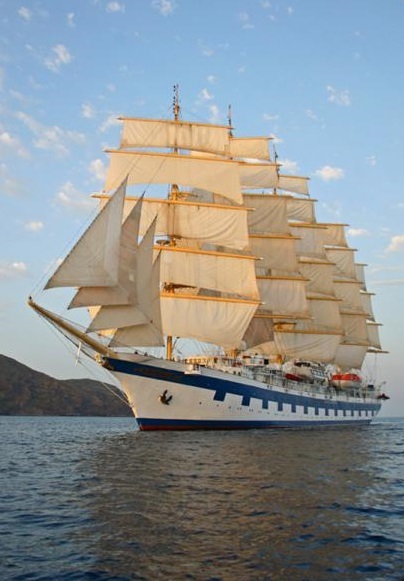 Royal Clipper is fully air conditioned, and the food operation on board is superb. You can have your laundry done, and even keep in touch with home – sometimes – via the patchy internet. The vast array of sails can be raised and lowered mechanically and, truth be told, it most often is. Cabins are compact, thoughtfully laid out retreats, beautifully embellished in various rich, dark woods. Mine had its twin portholes, a bed complete with duvet, and a bathroom equipped with a power shower. I just had to remember not to leave the shower on for too long, lest the rolling of the ship has led to it flooding the bathroom floor. There was also a television that I never actually got round to switching on, and a minimal amount of storage space for clothes. That said, this is anything but a truly ‘dressy’ adventure – the dress code throughout is mainly smart casual, so taking suitcases full of the latest fashions is not necessary. Inside, the nautical theme embellishes every nook and cranny. A main, upper level lounge has floor-to-ceiling windows along each side. With its own bar and sprinkled with groups of plush chairs, sofas and table groupings, this actually forms the upper level of a quite remarkable, three-storey atrium lobby. This area is the perfect place for an early, al fresco breakfast, with toasty warm croissants and preserves, plus all day tea and coffee on tap. Here is also where each of the main courses for dinner is displayed as plated, a very good idea. The menus for the day are on display here from mid morning onwards. From here, you descend via a gently curving wooden staircase to the dining room on the lower level. Flanked by the kind of whimsical frescoes that would not have disgraced Leonardo himself, this gorgeous ‘Gone with the Wind’ effect staircase is actually quite narrow, and certainly not wide enough for two people to pass by on without some subtle balletics. The main dining room spans the full width of the ship, and is studded with portholes that admit a welcome wash of Caribbean sunshine along both flanks. With tables seating from two to eight, all main meals are open seating. Breakfast and lunch usually feature a combination of buffet items and cooked-toorder dishes. Everything from eggs Benedict to fresh fruits and some varied, fresh-baked bread were on offer. Service in general was attentive, smiley, and in line with the casual vibe of the ship. Dinner was a la carte and, while the choices were not as extensive as on the big ships, the food was both filling and finely executed, with some truly excellent desserts. Steak and chicken were always available as alternatives to any of the three main courses offered nightly. Considering the tiny size of the kitchens on board the Royal Clipper, the catering department performed superbly. My waistline can attest to that. The real feast, of course, was outside. Here, as afternoon turned to dusk, returning passengers would gather at the Tropical Bar, with its open wooden deck and sides open to the breeze, to discuss the day’s adventures over cocktails prepared with adroit aplomb by Peter, the genial Jamaican bartender. This rustic, breezy rendezvous is the heart of the ship at any time of the day or night. Here, I nursed an obscenely good Margarita as Royal Clipper slipped past the lush green largesse of Dominica. The late afternoon sun cast long, languid shadows across the gorgeous swathes of greenery as a rainbow’s arc dissected the pale blue sky. Other than the murmur of muted conversation, and an acoustic guitar plucking slowly through a rendition of Hotel California, all that could be heard was the sound of water sloshing idly along the hull. I hardly dared breathe, for fear of breaking the spell. Eentertainment? There was a piano player out on deck each evening, and some late night disco music at the Tropical Bar, That, as they say, was pretty much it. The real entertainment was Royal Clipper herself. Cold wine in my hand on a warm Caribbean night, I would gaze up in solitary wonder at the carpet of stars flooding a sky that resembled a black velvet canvas. The sails swelled and then sagged like a gentle heartbeat. Ropes creaked; the ship heeled. Here and there, a plastic sun lounger slid a little. No Caribbean nights were ever more perfect; ship and sea in sublime harmony. Downsides? This is not for anyone with mobility issues. There are no lifts, and tender ports are a challenge even for the able-bodied. Raised steel lips frame the heavy doors that lead out onto the decks. The three pools are more in the way of plunge baths. 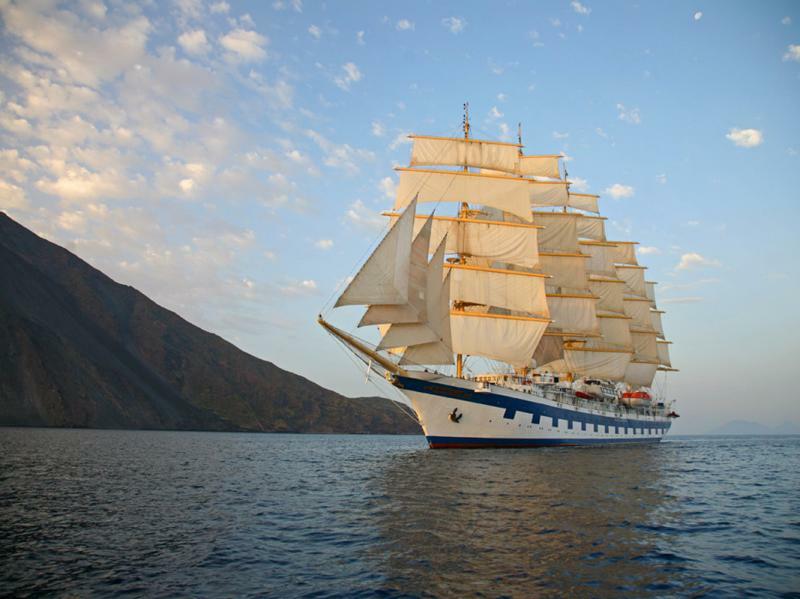 But the Royal Clipper experience is, simply, incomparable. This is a ship that shows her sinews in every place, one that emphasises her pedigree at every turn. 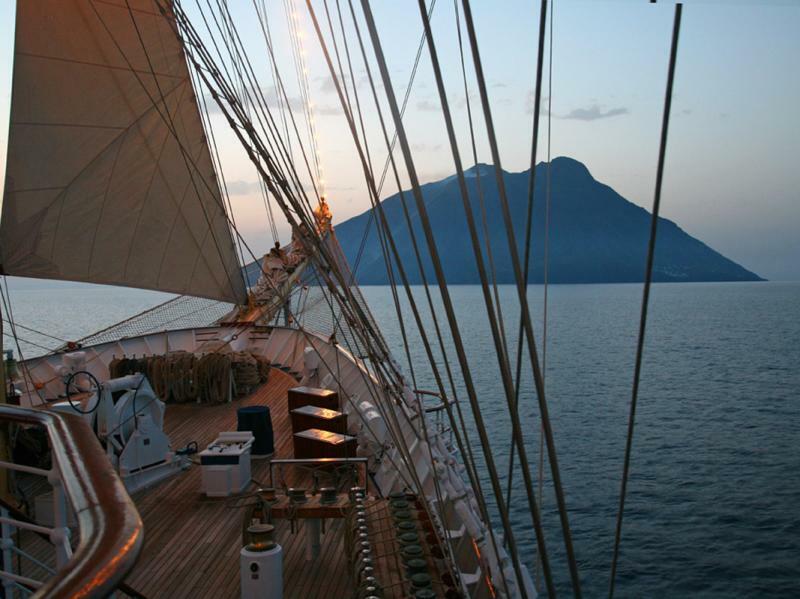 Comfortable rather than luxurious, but beautifully appointed and utterly captivating as her acres of serried canvas sails fill the sky, Royal Clipper is a truly tall order, and one not easily dismissed or forgotten.